A Previously Unknown Hopewell Hilltop Enclosure? 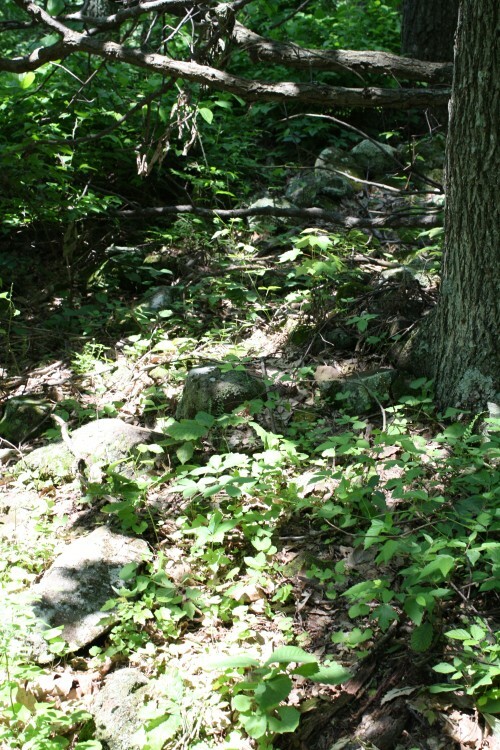 About two years ago I had the opportunity to visit Glenford Fort, a Hopewell hilltop enclosure in Perry County, the next county over from my county, Fairfield County. (Other Hopewell hilltop enclosures include Spruce Hill, Carlisle Fort, and Fort Hill.) 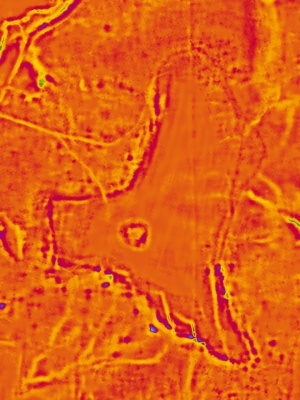 As part of that visit to Glenford Fort, I used my LiDAR-processing software to look at the area. Some of that shows just natural features (e.g., rock caps made from harder sandstone). 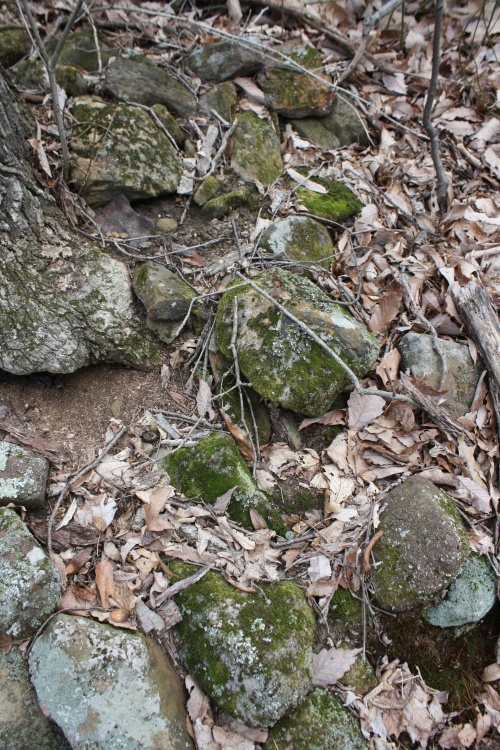 Some other parts show where a natural feature has been enhanced (by the Hopewell) by the addition of a bunch of rocks to build up an edge. So about a year and a half ago the folks at Clear Creek Metro Park acquired a new piece of property, and I went to help them out in planning a hike to the new area. I cranked up my software (which also does a pretty good job of showing existing trails, since they are slightly depressed into the surrounding terrain). This is one of the things that showed up for me. Then I took a look at where that was. No, they really don’t show up very well. But it is interesting that they help define the hilltop space (just as we saw at Glenford Fort where stones were added to enhance the natural topography). I would also note that this location is quite typical of Hopewell hilltop enclosures. It’s a high area overlooking the confluence of two streams. (For that matter, the Serpent Mound is at a similar location, except that the current knowledge suggests that Serpent Mound is from the Fort Ancient Culture, about 1,000 years ago, not the Hopewell, about 2,000 years ago.) This hilltop has an area slightly over 8 acres. This was its name. Every native knew it. Across the lake from our house. Some said the Indians pastured their ponies on the flat top. There was and is the remains of a stone wall fence on top seperating it from Little Stone Fence behind. Also, most of the top of the hill has a rim rock around it which would be too steep for the stock to come down. It would also be too steep for stock to go up and might well be considered as a fence. There was never must evidence of pasture in our time. 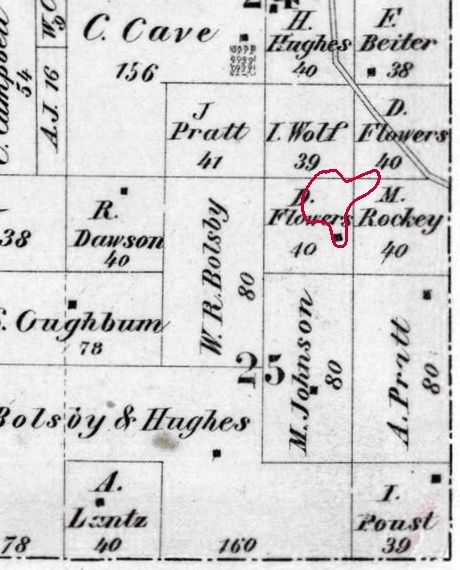 There was the remains of an old barbed wire fence seperating D. Flowers from M. Johnson in the Fairfield atlas of Madison Twp. in 1875 but the wood on either side was at least 40 years old when we bought from Rusk and Leo Kummler. This fence seemed to terminate at about the end of the wood to the east. Next, about a year ago I went to explore the hill, with archaeologist Dave Snyder of the Ohio History Connection and supervised by Park Naturalist Marcey Shafer. It turns out that all of that relief, the border, is natural. But really cool natural. It’s a cap of harder sandstone which leads to 8-12 foot high cliffs all around. Here’s a (stitched, panoramic) picture of the stones of Stone Fence where they end across the west side of the neck. As Dave Snyder looked around the area, he really didn’t see evidence of anything archaeological besides the Stone Fence itself. There are no mounds or other identifiable features. 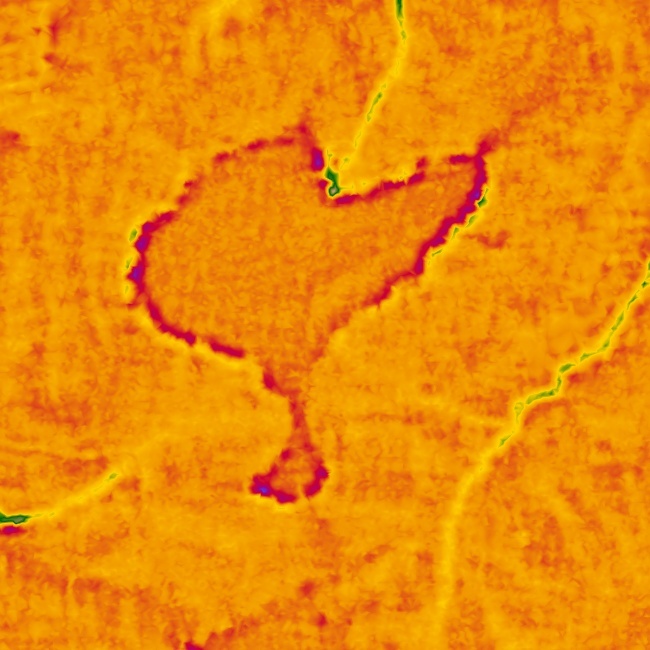 My software suggested there might be a structure on the northeast side of the hill, but on-site nothing was obvious. So we really don’t have anything else to go on but the Stone Fence itself. 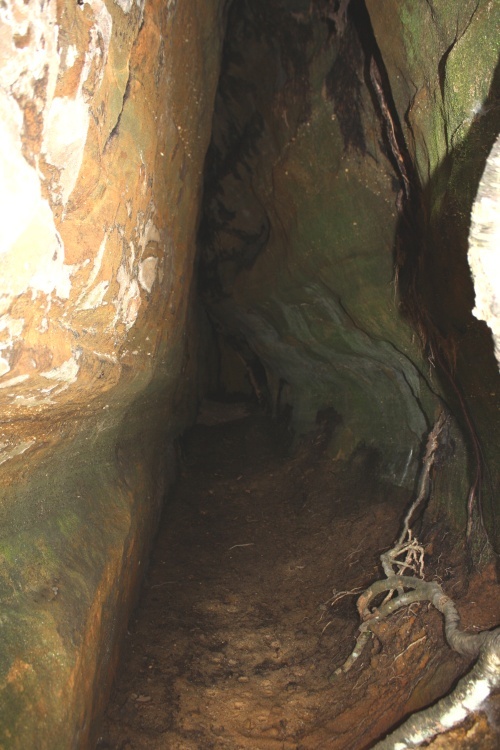 There is one other interesting feature there, though: a small recess cave. According to my compass (which, admittedly, probably isn’t all that accurate, particularly in my hands), it opens directly east, towards the spring and fall equinox sunrises. That could also make this particular site special to the Hopewell. Note carefully that this would be a coincidence, not something designed. But it could still make the site extra-special. (But again, there is no evidence of this, and when I was there I did not carefully inspect the cave for any markings that might have enhanced that possible interpretation.) However, as we saw from Mrs. Benua’s note, this site was known to Native Americans, so the knowledge could have been passed down through generations. So what we have here is something that is awfully suspicious as some sort of Hopewell hilltop enclosure. From looking at all of the other such places, it seems that this location would really resonate with them as being a very … important … place. However, there is not much besides the Stone Fence to indicate that definitively. It would be nice if more exploration could be done. However, the site is located within a Nature Preserve (and in a portion of Clear Creek MetroPark you’re not allowed to go to unless accompanied by park personnel). We’re not going to be digging up anything, or even whacking down vegetation so that a ground-penetrating radar system can be run over it. On the other hand, maybe something like a hand-held magnetometer could be run over the site just to see if further exploration might be fruitful. But I bet you there is interesting stuff up there—it’s just no longer visible. In the end, what we have here are hints. Hints of what similar Hopewell hilltop enclosures looked like and where they were located. Hints of pointing at the equinox. Now all we need to do is get folks interested in exploring the site further.